Early September, 2011 saw the final fruition of plans to form a band that did more than earn a spotlight and then fade away, when Siddharth Darbha who'd been meaning to form a progressive groove outfit for a while found in long time mates Advaith Mohan, Abhishek Nair(Anthracite), Surej Simon and Gautam Venugopalan the rest of this five-piece unit. Siddharth, who had a clear vision of the music he wanted to play, began to handle all compositional responsibilities. A short hiatus followed when Abhishek left for Bangalore. The faculties of the mic were then handled by RG Vignesh (I-Borg), until the band finally found their frontman in David Simon (ex-Blind Image, JJATOM). 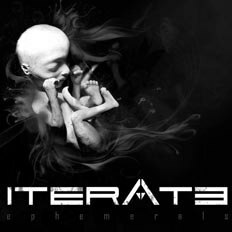 Drawing influences from a plethora of progressive/technical metal bands, Iterate got their name around for delivering a tight set of groovy and ambient soundscapes. Having over two dozen successful gigs like Score Night (hosted by The Score magazine), Unseen Underground and Unwind Center, and and a couple of competition-victories like CET's Dhwani and IIPM's Amaze in their kitty, the band without losing steam has since been working on their debut EP (and the album that is to succeed it).